Pretty as always, and I love the blue cardigan! waw; altijd als ik je blog zie denk ik "schoon kleedjes heeft die"
i love ur blog! and your hair is amazing!!! 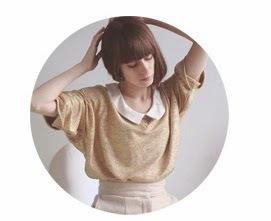 You've got a great vintage style..
Congrats for the feature. I love the dress and the bag. WELL I adore the bag! I love its shape. i am in love with that bag! pretty you! Lovely outfit, the polkadots are adorable. Congrats on the feature!